Iran’s firing of nine ballistic missiles on Wednesday was neither a test nor an exercise. It was a message to the West, United States and Israel. The message is that Iran has no intentions of halting its uranium enrichment program, which most observers believe is the first step in Iran’s development of nuclear weapons. The missile launches are the symbolic equivalent of thumbing your nose at the world. Despite the findings of the recent National Intelligence Estimate report that Iran suspended its nuclear weapons development program in 2003, both presidential candidates have stated that Iran is actively pursuing nuclear weapons. The Iranians claim they are merely exercising their legal right to develop a nuclear energy capability. A look at their nuclear research and development facilities, hardened and buried structures dispersed over the breadth of the country, would suggest otherwise. It has all the earmarks of a weapons research and development program and the fact that much of it is underground and hardened indicates that the Iranians believe it must be defended. Defense is not an issue for a peaceful energy program. The Israeli intelligence agencies strongly disagree with the American assessment that Iran has suspended its nuclear weapons program. They believe that Iran is working deliberately and with a sense of urgency toward the development of a nuclear weapon. The Iranians already have a delivery system that puts all of Israel in range and they demonstrated that capability once again on Wednesday. This comes just weeks after Israel conducted what many believe was a “profile mission” hundreds of miles out into the skies over the Mediterranean, replicating a flight from Israel to targets in Iran. The so-called Iranian missile “tests” were carried out near the Straits of Hormuz, an interesting venue. At a time of record oil prices, conducting missile launches at the spot that overlooks the waterway that carries 25 percent of the world’s daily oil supply is sure to attract attention. It highlights the vulnerability of the sea lanes out of the Persian Gulf. The threat of closure of the straits prompted the commander of the U.S. Fifth Fleet to remark that the U.S. would not allow Iran to close the waterway — strong words. One possible unintended outcome of the continued Iranian intransigence and continued demonstration of log-range ballistic missile capability is more acceptance of an American missile defense system in Eastern Europe. Despite angry rhetoric from Moscow, Russia’s allies in Tehran are doing more for the installation of the American program than Washington can hope to do. In the past when confronted by the West, Iran has offered to voluntarily suspend uranium enrichment for a short period of time to allow diplomatic efforts to proceed. This is merely a tactic to buy time to continue the program. They again made this same offer, and at the same time demonstrated their ballistic missile capabilities. No one trusts the Iranian leadership, nor should they. Iran will continue this cat-and-mouse game, demonstrating military capabilities intended to put the Israelis on notice that they are in range, and to put the rest of the world on notice that its oil supply may be put at risk. 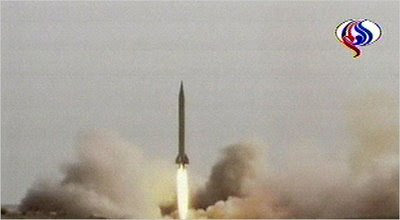 Iran has no intention of abandoning its quest for nuclear weapons, despite the stream of denials from President Mahmoud Ahmadinejad. These missile demonstrations are yet another step that is bringing the West, Israel, the U.S., or all of the above, closer to a confrontation with Iran. Instead of trying to lower tensions, the Iranians seem intent on inflaming the situation. They may push Israel to the conclusion that Iran is indeed an existential threat to the Jewish state. Once Israel believes that, they may exercise the military option. If Israel decides to attack Iran’s nuclear facilities, it will be probably the riskiest military operation they have ever undertaken. They will not attempt it until they have made the assessment that there is no other option and their survival as a nation and a people are at risk. With Ahmadinejad continuing his verbal assaults on Israel, the Islamic Revolutionary Guard Corps flexing its military might, Iranian intransigence on the uranium enrichment issue, Israel may be nearing that conclusion. Launching nine ballistic missiles at the mouth of the Straits of Hormuz does not advance the dialogue.